Cygnett's latest range of iPhone 4 and iPhone 4S cases have arrived in Australia and Impulse Gamer checks out the rather cool Ripple Textured Flex-Case. Best of all, this case is compatible with both the iPhone 4 and iPhone 4S which ensures that both users of these devices will not only have their phones protected but they will be protected in style. Made from a very flexible and durable TPU material, the Ripple basically fits like a glove for your iPhone and comes in two colours, Blue (CY0597CPRIP) and Black (CYO596CPRIP). We reviewed the blue case that not only looks good once installed but protects your iPhone should the unthinkable happen. Offering a 2-years manufacturer's warranty, the Ripple also comes with a screen protector and a microfiber cleaning cloth that keeps your iPhone screen clean. Before we installed our iPhone 4S into the case, we first installed the screen protector which was the hardest part of the installation process. In order to install the screen protector, you first need to clean the iPhone screen with the microfiber cloth and then carefully remove the first layer of the protector which has been labelled as 1. Once the first layer has been removed, you then need to line up the protector with your iPhone screen and lay it out down. Finally, you just remove the last layer of the screen and presto, the screen protector is installed. There may be a few air pockets when you do install the screen but with a credit card, you can push these bumps to the side. This protector basically protects your iPhone screen from scratches and grime. The next step is to install the Ripple and iPhone 4S simply slides into it like a glove. The first thing that you will notice about the Ripple is the textured design on the back which forms ripples. This design assists in holding the iPhone 4S in your hand and the TPU material ensures that it won't slip out of your hand thanks to the anti-slip material. Thankfully once installed, you have all access to your iPhone 4S controls from cameras to buttons and docking. Another highlight of the case is that it has a slightly raised edge on the front which ensures that if you do drop the phone, the raised edges will hopefully protect your smart phone's screen. 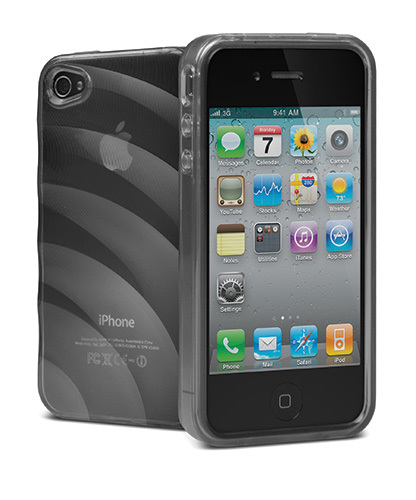 All in all, the Ripple is a very well designed case for your iPhone 4 or iPhone 4S.